Hello everyone, like I said I’ve decided to actually post more as I really do enjoy blogging a lot. Today I decided I’d do a discussion type of post, purely because I’m saving some beauty/fashion posts for other days! Anyway, I saw this picture on tumblr recently and it did really make me think. I know its a simple sentence, that is quite easy to ignore but I did have a good think about this. I think this is a lot to do with confidence issues, and how much self confidence you have in yourself, and honestly I’m one for this too. I do worry a lot about what people will think if I wear a certain item of clothing, and I think this is the problem for a lot of other people too. You worry that people will judge you, right? The thing is, the majority of the people you will see within your day, you will never see again. So if they do make a quick judgment in their head, for a start you’re not going to know, and secondly, who cares? You will most likely never see them again! Don’t worry about what others think, because really, you probably look super good in what you’re wearing and people may just be jealous. I know everyone always says, “Oh they’re just jealous,” but I think that’s the truth, because you can look amazing in those new trousers, or top, and that person maybe couldn’t pull it off like you have. 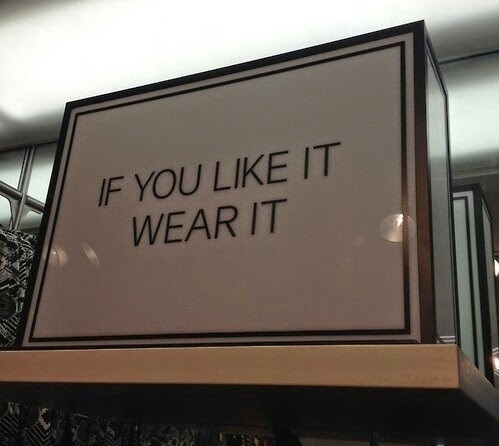 So I encourage you to go out of your comfort zone, or just go out and buy that outfit you love, don’t be afraid, you’ll look super good in whatever you’re wearing! Thanks for reading guys, I hope this gave some of you some self confidence or just maybe some inspiration to go out and buy something you’ve been to scared to wear for a while. It’d be nice to know that I’ve maybe made a difference somewhere.